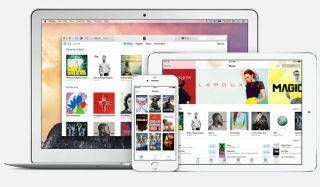 Apple pushing for the end of free streaming music | What Hi-Fi? Reports suggest Apple is pushing record labels to put pressure on music services such as Spotify to remove their free tiers – a move which has attracted attention from US government anti-competition agencies. Apple is set to launch its streaming music service in June at Apple's Worldwide Developers Conference, and it looks like an entry-level free tier is going to be off the menu. There have already been rumours that Apple would not offer a freemium tier for its music service, and now reports suggest the company wants the rest of the industry to follow suit. The Verge reports that Apple is trying to use its considerable power to convince record labels not to renew Spotify's license to stream music through its free tier. Spotify and YouTube, owned by Google, are said to be the two main services in Apple's sights, with sources suggesting Apple would pay Universal Music the fee it normally receives from YouTube if the label agreed to stop allowing its songs to be on YouTube for free. Apple's efforts are said to have caught the attention of the US Department of Justice and the Federal Trade Commission, who are said to be looking closely at the company's business practices around music streaming. Spotify says it has over 60 million active users but only 15 million of those pay for the service, while Deezer also offers a free subscription plan. Removing the option of free tiers would leave plenty more people potentially in the market for a premium music service - no bad thing for Apple's new music service. We expect to see Apple's streaming music service unveiled in June at WWDC, which gets underway on 8th June. It's widely-rumoured to be a revamped version of the Beats Music service, following Apple's $3bn acquisition of Beats in May 2014. It's expected to be more deeply ingrained in to Apple's iTunes ecosystem, most likely a standard app within the new iOS 8.4, instantly putting Apple's Music service on millions of iPhones. Apple has been busy hiring music producers and DJs who are expected to be leading Apple's content curation teams. Four BBC music executives joined Apple last month, following in the footsteps of Radio 1 DJ Zane Lowe. CD-quality streaming rival Tidal has already put playlists, editorial content and exclusives at the centre of its offering, with the company's star-studded backers releasing songs and live concerts exclusively on Tidal. It remains to be seen whether Apple will offer lossless, high quality streams and indeed the extent to which it might offer exclusive music. All is set to be revealed next month.